It’s hard to say no to a decadent chocolate pudding. But making them can be time consuming and creates a pile of dishes! 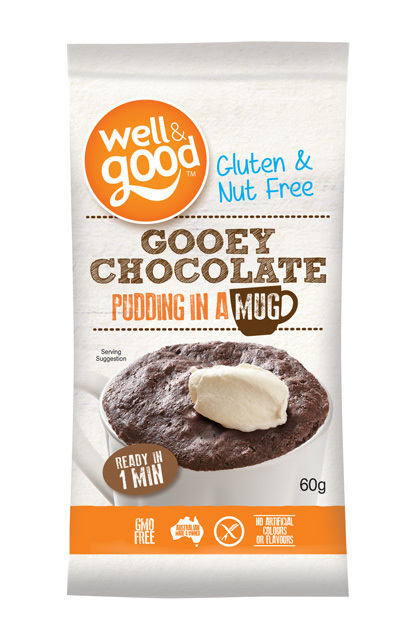 Enter Gooey Chocolate Pudding in a Mug; the perfect way to get an indulgent gluten free treat the easy way. Simply add this mix to a mug and add your choice of milk then microwave for two minutes. Hey presto, your dessert is ready! A quick afternoon snack at the office, emergency dessert after a long day of sports with the kids or just because you feel like an indulgent treat! Whatever the reason, Well and Good Pudding in a Mug has arrived to save the day! A Gluten Free dessert that’s ready in less than 2 minutes – this yummy treat is also available in Salted Caramel and Spiced Banana.